Youth exchange students from all over the world come to Rotary District 5080 for a 10-12 month exchange ("long term exchange") or a 6-8 week exchange ("short term exchange"). At the same time, youth exchange students from District 5080 travel to Europe, South America, Asia or Australia. Rotary District 5080 includes southeastern British Columbia, Canada, northern Idaho and eastern Washington, USA. This area offers extraordinary scenery and recreational activities in and around the small towns and cities of the district. Excellent schools and cultural opportunities are found throughout the district. Rotary district 5080 is a region of Canada and the USA. The center of the area is about a day’s drive from Vancouver, British Columbia, Canada or Seattle, Washington, USA. View this interactive google map for details. Rotary is a global network of community volunteers. Rotary club members are business, professional, and community leaders who provide humanitarian service, encourage high ethical standards, and help build goodwill and peace in the world. More than 34,000 clubs and 1.2 million members conduct projects to address today's challenges, including illiteracy, disease, hunger, poverty, lack of clean water, and environmental concerns. 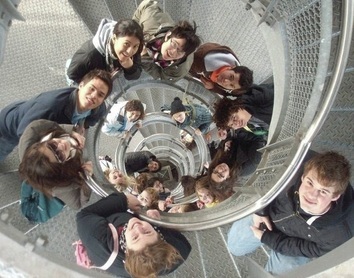 Youth Exchange is just one of many Rotary programs that seek to make the world a better place. More information about Rotary can be found on the Rotary International website. Rotary Youth Exchange is the world's most experienced student exchange program, backed by the world's largest and finest service organization, Rotary International. Each year, thousands of young people from around the world make the journey to another land and live for a year in the homes of host families selected by local Rotary Clubs. While abroad, they attend school, they share in household duties, and they assume the life of a normal teenager in the country where they live. And while they are learning, the people around them are learning too, because every Rotary Exchange Student is also a young ambassador, sharing their ideas, sharing their culture, and making friends in a distant part of the world. Rotary International strives to create and maintain a safe environment for all youth who participate in Rotary activities. To the best of their ability, Rotarians, Rotarians' spouses and partners, and other volunteers must safeguard the children and young people they come into contact with and protect them from physical, sexual, and emotional abuse.